All of us programmers have at some point tried to speed up a large program. We remember "measure before optimizing" and profile it, and end up (a few hours later) with something intimidating like this and.. what next? If you're like me, you scratch your head at the prospect of optimizing StringAppend, and the call-graph seems to tell you what you already know: Your program spends most of its time in the main loop, divided between the main subtasks. But the details were hazy. Especially in step 3. Michael Abrash was clearly doing a lot more than this. What was it? Worse, I kept forgetting to use the profiler. I'd have a split-second idea and blunder around for hours before remembering the wisdom of "measure before optimizing." I was forgetting to measure because I was getting so little out of it, because I'd never learned to do it right. After a lot of trial and error in the last few months, I think I have a better sense of the process. Optimization is like science. You can't start with experiments. You have to start with a hypothesis. "My program is spending too much time in _." Fill in the blanks, then translate the sentence for a profile. "I expect to see more time spent in function A than B." Then run the profile and check your results. Skip the low-level stuff, look for just A and B in the cumulative charts. Which takes more time? Is one much more of a bottleneck? Keep an eye out for a peer function that you hadn't considered, something that's a sibling of A and B in the call-graph, about the same level of granularity. Do this enough times and you gain an intuition of what your program is doing, and where it's spending its time. When you do find a function at a certain level of granularity that seems to be taking too long, it's time to focus on what it does and how it works. This is what people mean when they say, "look for a better algorithm." Can the data structures be better organized from the perspective of this function? Is it being called needlessly? Can we prevent it being called too often? Can we specialize a simpler variant for 90% of the calls? If none of that generates any ideas, then it's time to bite the bullet and drop down to a lower level. But remember: optimization is about understanding your program. Begin there, and profiling and other tools will come to hand more naturally. The Age of Enlightenment in the 18th century weakened the grasp of the church over society, and tried to replace authorities like God, church and king with critical thought. Enlightenment led to the Age of Revolution, primarily the American and French. But the French revolution seemed to expose the failure of the Enlightenment's worldview, one that could cause both utopian liberation and tyrannous oppression. It felt like a new Fall of Man. The world lost its value; life lost its meaning; the individual no longer had grounds to reason about right and wrong. Those who articulated this dissatisfaction were the early Romantics, and they ushered in a new artistic, literary, and intellectual movement. In the process they created several iconic anti-roles that we still recognize in popular culture. The Byronic hero appears as the wanderer, the outcast, the Wandering Jew, the mysterious criminal whose crime is never explained. The tremendous appeal of Byron's poems throughout Europe and America shows how widespread was the feeling of malaise. 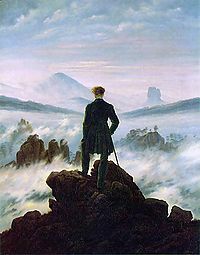 “Wanderer above the Sea of Fog”. The Visionary was the first stage of recovery and the first positive Romantic anti-role. The word often used at the time was “mystic.” The Visionary tries to observe the world so intensely as to get to the essence outside of all mental categories. It was felt to be the special task and privilege of the artist and poet to communicate that experience. The Bohemian is perhaps the most modern of the anti-roles, characterized by a fascination with alcohol and drugs and sexual experimentation as ways to shift and change consciousness, put the mind through permutations of perceptions which are impossible for the square who is boxed in by his social role. Similar is the interest in non-bourgeouis modes of living, in indifference to middle-class standards of dress, furnishing, and cleanliness. The Dandy transforms the role not by excess but by irony. The role of the highest status in European society is that of the aristocratic gentleman of leisure. By willfully playing this role better than those born and trained to it, the Dandy reveals the pointlessness of the socially adapted. The social type with the highest status spends his life in play and pettiness. The Dandy instead offers perfection and elegance without content, without social function. By stealing the clothes of society, he reveals its nakedness. He demands a greater exquisiteness and perfection than society can achieve. This explains the irritation of society with the Dandy, its efforts to deprive him of his ironic authority, the moral nastiness with which England relished the downfall of Oscar Wilde. When I build services or write online I want to get feedback. Did anybody use them? Read my latest post? When my site has just a little traffic Google Reader summarizes too much. I want to be able to get my hands dirty with the data, to be able to drill down to individual user sessions to see how people interact with my site. How many real users did I have yesterday? Did somebody link to my latest blog post? How many people clicked on that link on Hacker News? Did any of them stick around and browse to other pages? How many uniques did I get yesterday? Focus on real human beings. Wow, 15 IPs? Did they stay long? Hmm, so 4 users browsed several pages. Where are they coming from? Ah, they're all coming from http://news.ycombinator.com/item?id=1702108. So people actually clicked on that comment of mine, even though there were no votes or responses. Interesting.. This one guy viewed 10 pages. What did he see? So he visited twice yesterday, once in the morning and once late at night. And clicked through to different sites each time. You get the idea. It's just a bunch of shell scripts that read and write YAML. And I can string them together using shell pipes rather than writing one-off scripts like I used to. Once I put these scripts together I found most queries had a similar format: parsing apache logfiles using cat_logs, filtering bot user-agents through skip_crawlers, some stages of filtering by or grouping by certain fields, leaving YAML using dump_field, followed by non-YAML summarization — de-duping (uniq), counting (wc -l), or frequency-distribution (freq). Try it out and tell me what you think: Yam. You just built something and are trying to get the word out. What are the ethics of telling a bunch of strangers about it? Is all unsolicited communication spam? If I send a message to three people, is that bulk? What if I send a million mails, each email by itself? What if the wording of the messages is different? How different does it need to be? The first component measures harm to the receiver and the second measures harm to the service provider. Let's try out a sanity check: A random email from your spam folder. It is undesirable to you, and the sender clearly knows it. They've sent out another batch a few hours ago with negligible click-through rate, they've been sending these messages for months, maybe even decades. They're forging headers and adding nonsense words to try to evade spam filters. And it's going out to a few million people and significantly adding to internet traffic. Verdict: definitely spam. Is there almost no chance they'll like it? Stop. Is it very uncertain they'll like it? Tell just a few people. If it does well you can increase volume in a subsequent campaign. Are you seeing signs that they didn't like it? 1 in 100 people complained about it? Only 1 in 300 responded? Stop transmitting. If you genuinely think some of your recipients may find it useful, if you're not trying to tell too many people all at once, and if you're prepared to stop and take stock of how the first batch did — go for it. There are no numbers in this reasoning, but I don't consider that wiggle room. It's hard to translate the sender's opinion into a number. If you are wrong in your opinion you'll find out from the recipients of your initial small batch. If they tell you and you don't heed them, you're spam. If you try to sidestep their comments in superficial ways, you're spam. The volume measure is even more relative. What would be considered spam 10 years ago wouldn't today. Especially if you stop transmitting after one batch. One corollary of this analysis: if it's unsolicited and in bulk, and you're sending it anonymously, it is spam. Period. Advertising requires accountability.